Bao Casino is a brand-new site to explode into the online Bitcoin casino community. Launching in 2019 with a bang. The trendy casino offers gamblers excellent welcomes bonuses and promotions that leave their longer established counterparts in their dust. Despite being brand new in the market they have already brought on board all the best game providers in the industry, showcasing the best and most cutting-edge games on their site. The interface is polished with a splash of vibrant color. The layout is neat and easy to use as well as extremely informative. 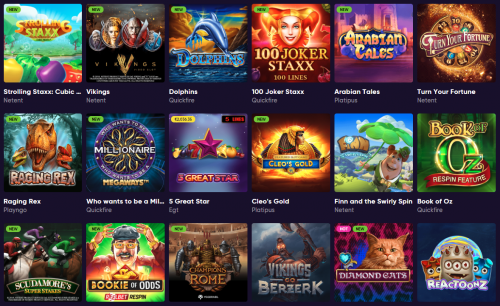 Just from the landing page gamblers are able to access all their games, see the accepted payment methods as well as which game providers supply the range of excellent games on offer. The likes of NetEnt, Microgaming, Play’nGo, Yggdrasil and Evolution all have games featured. Bao Casino offers a mobile-friendly site which is accessible easily on all mobile devices. There is no need for an app as all the action can be accessed through a preferred browser and the mobile-optimized games are designed to work seamlessly no matter from where or on what device a gambler is playing. To round things off Boa Casino has ensured that all its games are Provably Fair and all visitors to their site are completely secure with regards to their wallets and identity. 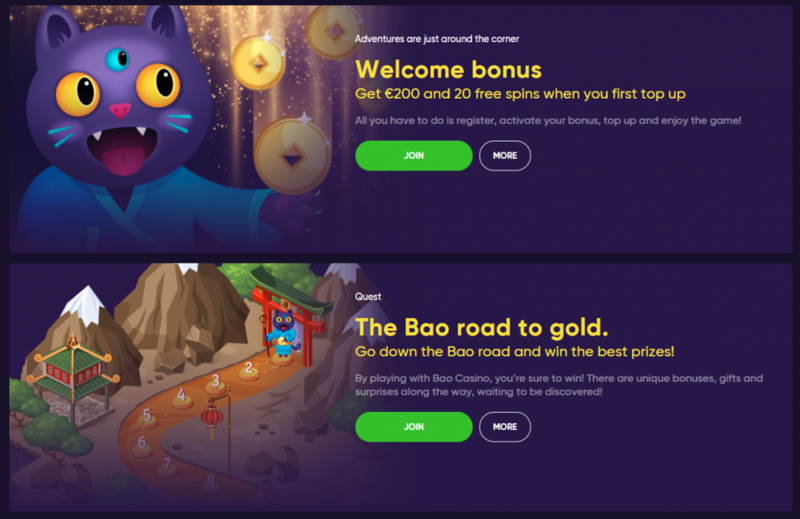 Bao Casino has taken the guesswork of gambling on their site out of the picture. Games are neatly tabbed at the top of the screen into the various categories of play including Slots, Popular, New, Jackpots, Live Casino, Crypto Games, and Table Games. The slot section is well equipped with all the latest slots with a good variety of themes, the rate of pay-out, and multi-layered features. Games include some of the greats such as Fynn and Swirly and Starburst by NetEnt, Jonny the Octopus and Slotomon Go by BGaming, and Diamond Cats by Amatic. Table games are not neglected and there is a great range for those who like online gambling with the traditional table style games. There are various games of blackjack and roulette alongside poker games like Casino Stud Poker and Casino Hold’em. Video Poker is also well featured with the likes of Aces and Eights, Aces and Faces, Bonus Deuces Wild and Joker Poker all represented. BaoCasino hosts live casino with professional, friendly dealers to make the experience a memorable one. Game to be played live are Live Blackjack, Live Roulette, and Live Dragon Tiger. There may be no Free Spin No Deposit Bonus at this point Bao has two excellent promotions that are sure to lure new players to their site and keep them coming back for more. There is a fantastic Welcome Bonus as well as a promotion that offers a variety of rewards. 1st Deposit – 100% Match Welcome Bonus up to €200 plus 20 free spins on Yggdrasil’s Jungle Book. Go Down Bao Road – By playing your favorite games, you can level up to earn new bonuses, which can range from free spins, cash bonus, cashback, and epic prizes. The casino will be launching new bonuses and promotions as they become more established and develop their brand. Currencies accepted by Bao Casino include US and Canadian Dollars, Euro, Krona, Rubel’s, New Zealand Dollars, Australian Dollars, Bitcoin, Bitcoin Cash, Litecoin, Ethereum, and Dogecoin. While deposits and withdrawals are facilitated by some of the most well-known and established financial institutions such as Visa, Maestro, MasterCard, Skrill, Neteller, Paysafe Card, iDebit, InstaDet, Zimpler, EcoPayz, NeoSurf, and Sofort. While bank transfers can take up to 7 days, all cryptocurrency transactions are immediate. To ensure gamblers receive the utmost protection with regards to the security of their wallets, Bao Casino has made sure to use a high-level Secure Socket Layer encryption to keep all sensitive information secure and sent to their protected servers. All games use a Random Number Generator (RNG) that can be tested by gamblers at any time of their experience with Bao Casino. Should players have any queries or concerns there is a professional dedicated support team, who are available 24/7 to help you out via Live Chat, Contact Form or an informative F.A.Q page. Bao Casino also supports Responsible Gambling. While being a brand-new kid on the block, this does not mean that Bao is not taking a leading position in the online Bitcoin gambling market. They have come to the party with a sleek and sophisticated site that offers an optimized gambling experience to players both old and new. A strong suit of games and a good variety of currencies topped off with an excellent team behind the scenes, gamblers are sure to achieve big Bitcoin wins and have a really good time while doing it.